MVC stands for Model View Controller. The Spring MVC framework is one of the popular frameworks across all the frameworks available in the market. 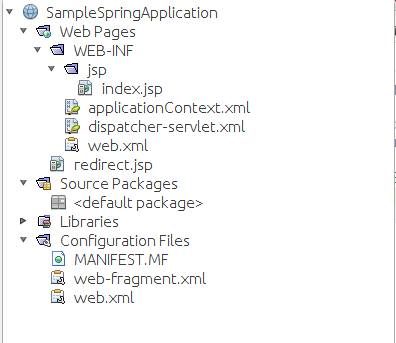 Because the advantages of Spring MVC framework tells the importance of Spring MVC. In this tutorial we are going develop step by step Spring MVC Helloworld Example using Netbeans. 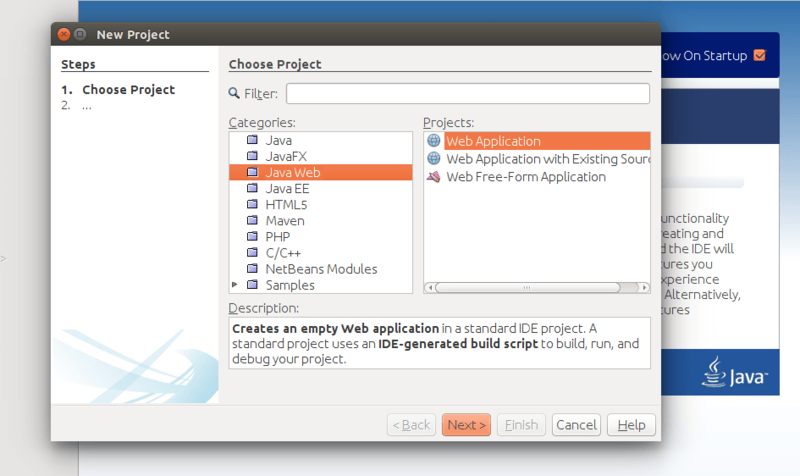 Step 1: Create a new Project in Netbeans by selecting the new project in File menu and select the web application in the choose project pop-up and click next. Step 2: Give the project name as you want, For now I am giving SampleSpringApplication. Choose the project location where you want to save the project. By default it is in Netbeans projects in your home directory. If you want to place all dependencies (libraries) in one folder, you can check the Use Dedicated Folder for Sorting Libraries option. Then click next. 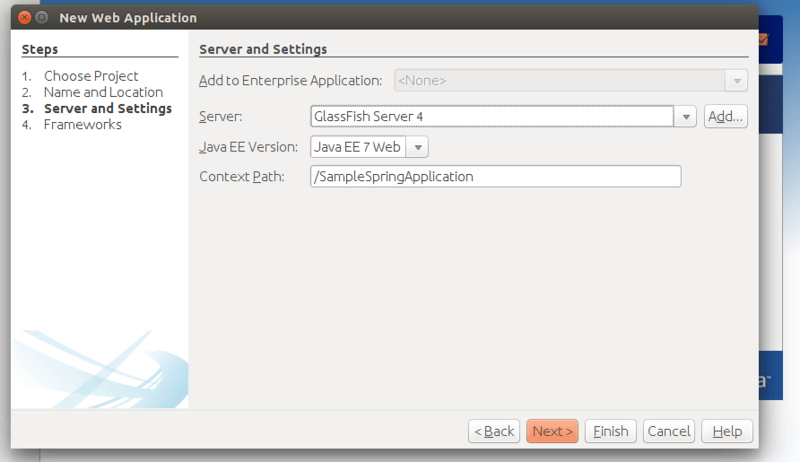 Step 3 : Select the application server and J2EE version from the drop-down menu. And select next. 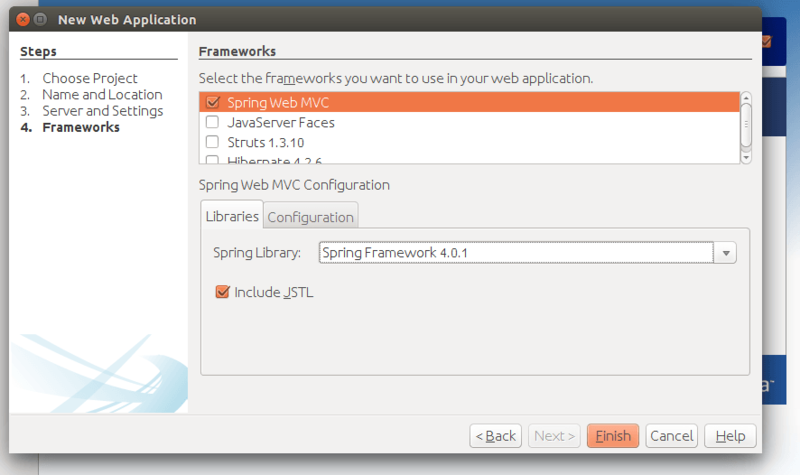 Step 4: Select the Spring Web MVC frame work from Frameworks menu. You can also select the version of the selected framework in libraries tab. If you want to include the JSTL in your application, you can select the JSTL check box. And click finish. Step 5 : Yes, we are done. 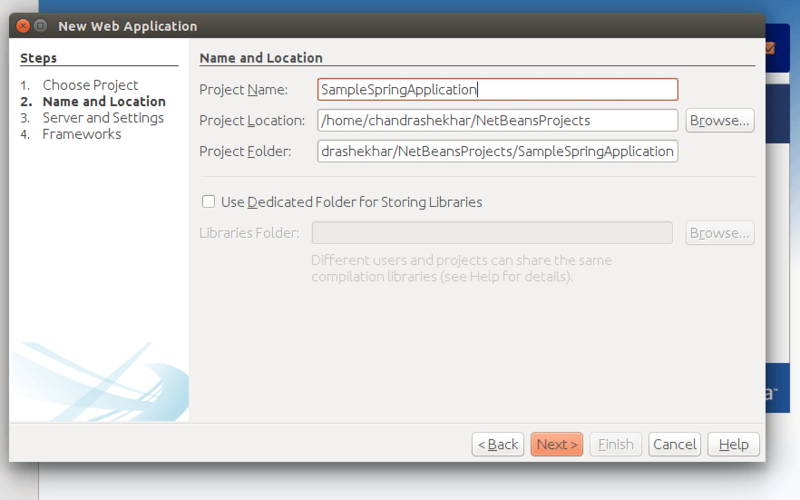 By clicking on the finish button, netbeans will provide us the basic spring application architecture like below. Step 6: Update the diapatcher-servlet.xml like below. 1.A tree view after creating the new files would be helpful, so that everyone knows where exactly in the file directory the new files are to be created. 2.Not the end state of the default files but what is specifically edited (before and after)? That would I have wanted to know. Thanks for you lot. This is really help to me start learn Spring framework. Nice article. Very helpful. I am having some doubts regarding the request flow. 1. Request url is containing ‘helloworld.htm’. 3. Dispatcher servlet has ‘context : component scan’ . using this, spring understands that there must be some controller class for which there is @Controller annotation for it and @Request Mapping annotation is added with value = ‘helloword.htm’. i.e. all requests with such url pattern should be re-directed to this controller. 5. Response of this method will be returned. 2. What if I want to redirect the response from this method to some other jsp file ? 3. If I am having multiple methods in controller class, and want to call different methods in different situations, how would I manage it ? 4. Does the sequence of ‘xmlns:context’ and ‘xmlns:mvc’ matters ? The only full working tuto. Thanks a lot.